So much yarn, so little time. : Art? Graffiti? Banksy? 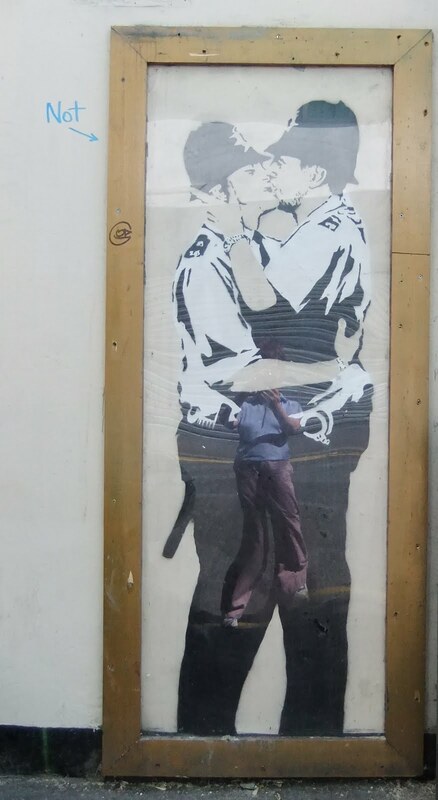 While we were in Brighton this week our son suggested we went to see the Banksy on a pub wall near where he lives. Banksy, however, is considered a *real* artist and commands very high prices - which got me thinking about "Art", as we wandered the streets looking for the Prince Albert pub, site of the "Art" in question. I've only just noticed my reflection in the policemen's trousers - do you think it adds to the image? Here it is again, without me! I don't know the back story - feel free to explain in a comment if you know. 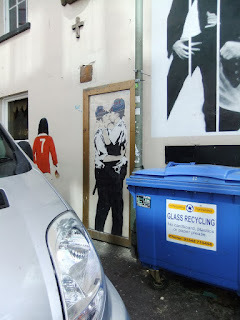 It is of course a political piece - Brighton is the gay capital of the UK and this image of gay policemen was painted in 2004. It wasn't until 2007 that uniformed gay policemen were allowed to take part in Brighton's Gay Pride march. As I took my photo, a barman rolled out a barrel from the pub and stopped to chat. He explained that what I was photographing wasn't actually the "real" Banksy, it was a copy. The "real" one has been removed and is for sale! This got my brain ticking further. Who "owns" street art? Presumably Banksy wasn't commissioned by the publican, I imagine he painted it as a statement and intended it for all to see and react to. To my mind, Art is a conversation between artist and audience - this is why I never understand so-called Art painted by elephants or copies of Old Masters. OK so maybe they're pretty, but there is no dialogue. Leaving that aside - I was happily photographing a fake. And I wasn't the only photographer, even in the brief minute I stood there. Who would get the money? I googled, and apparently it's likely to make a million pounds. The publican says it'll go to maintain the pub. Does it matter that the one now on show is a fake? I wouldn't have known if the barman hadn't been feeling chatty. Would you have known? The newest Banksy is apparently in London. 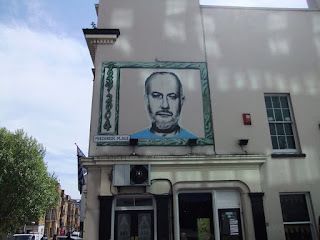 Westminster Council removed the last one (it didn't have planning permission) so hurry up if you want to see it! I'd love to hear your thoughts. Personally, I enjoy street art and think it brightens up our urban environment. I totally understand why the publican would want to capitalise on his luck - but at the same time I think the Art deserves to stay where it is for all to experience. At the same time though, I would have been just as happy with the copy because I wouldn't have known. But now...I *do* know. I don't like it when people copy my own work. But this isn't about what the Artist himself thinks, he hasn't (as far as I know) given an opinion. He's painted, expressed himself, moved on. Street Art by its very nature is ephemeral. 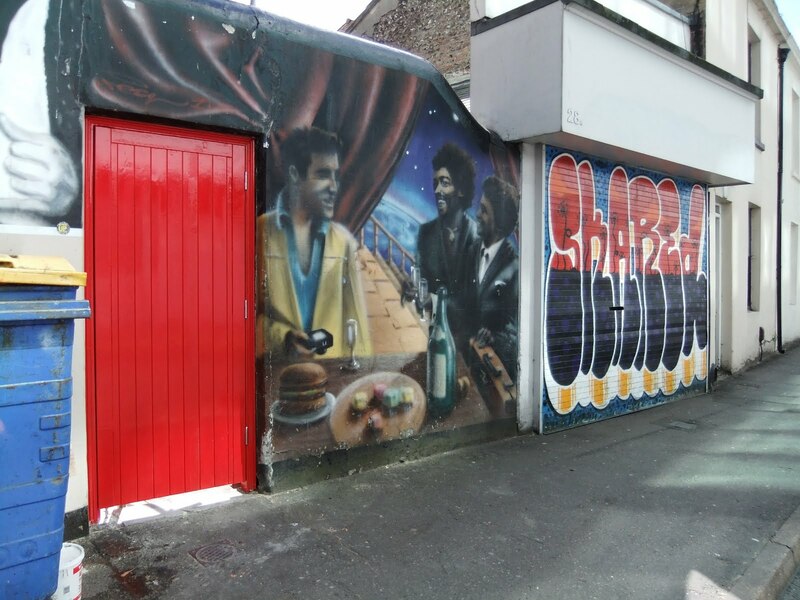 A Graffiti Artist knows the council may remove his work at any time. If he wanted it to be permanent, he'd buy a canvas, wouldn't he? And yet - oh I don't know. What do YOU think? Just to confuse the issue still further - this was just around the corner! I think graffiti is art - although there's some of it that's done not well and put in obnoxious areas (spraypainting on the side of a church or something, not appropriate!) but what you have posted in your blog, I think is definately art! It's there for people to enjoy, for people to think, and to admire. As far as who owns street art - it's for the masses. Remember when hippies used to say "you can't OWN land, man"... same goes for art in this case. It's made annonymously, in a great public forum, for everyone to equally enjoy. And kudos to the graffiti that was not only maintained, but framed and plexiglassed. It's interesting to see that random acts of talent are being appreciated. hum, disscusion about art always reminds me of a sketch in the mary whitehouse experience about 'what is art?' still makes me chuckle! I'm not sure about it. I think the Banksy's are interesting and I've stopped and enjoyed a few at close quarters myself (well i was told they were from him). However I wonder if they encourage more people to graffiti in the name of 'art' or just to try and get famous which seems to be what concerns most people. I like the natural art you see from Andy Goldsworthy, where the art is allowed to decay back to nature - I would love to stumble across one of his pieces. I'm sure there's one in Paignton too but that hasn't been claimed yet.